Papua New Guinea Accident Investigation Commission (AIC) issued a preliminary report on their investigation into the December 23, 2017 fatal accident involving a BN-2A Islander. The BN-2A Islander aircraft, registered P2-ISM, owned and operated by North Coast Aviation, impacted a ridge, at about 9,500 ft on the ridge that runs down towards the Sapmanga Valley from the Sarawaget Ranges, Morobe Province in Papua New Guinea. The pilot elected to track across the Sarawaget ranges, from Derim to Nadzab Airport, not above 10,000 ft. GPS recorded track data immediately prior to the last GPS fix showed that the aircraft was on a shallow descent towards the ridge at that time. The aircraft impacted the ridge about 150 metres beyond the last fix. 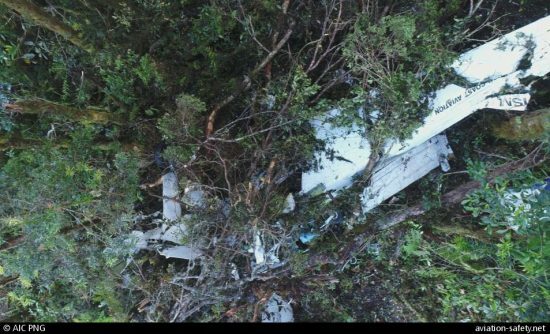 During the search for the aircraft, what appeared to be the right aileron was found hanging from a tree near the top of the heavily-timbered, densely-vegetated ridge. The remainder of the wreckage was found about 150 m from the aileron along the projected track. The aircraft impacted the ground in a steep nose-down, right wing-low attitude. The majority of the aircraft wreckage was contained at the ground impact point. The aircraft was destroyed by impact forces. The pilot, the sole occupant, initially survived. The pilot had made contact with one of the operator’s pilots at 16:15 on 23 December. Bad weather in the area prevented a recovery until December 26. By that time the pilot had died of his injuries. On 6 January 2018, the AIC investigation team, assisted by two aircraft engineers from North Coast Aviation, reached the accident site and conducted the on-site phase of the investigation. The investigators used the AIC’s recently acquired drone to survey the accident site, which enabled the investigation team to capture video imagery and photographs from above the trees, and below the foliage canopy over the accident site. Previously a helicopter would have been required, and due to rotor downwash disrupting the wreckage, a helicopter would not be able to gain such close access.